The game of hookey is an Australian classic. Toss your rings and snag'em on an open hook to score your points. 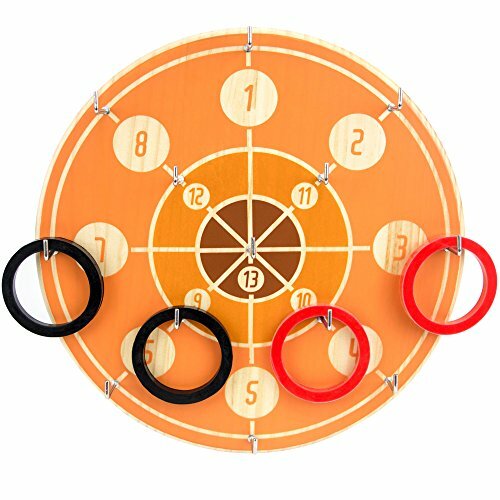 An irresistible cross between ring toss & darts, this simple game of skill is easy to learn, tough to master! Hookey is great for getting two or more people up and moving! While it's easy for kids, teens, and adults to learn, it takes some practice to win. The board is made from natural New Zealand Pine that is strong and durable to withstand and tosses or drops. Set up is made simple with an attached hanger on the board. Choose between the standard and expert versions to play and you'll be hooked! 1. First, decide on a winning point value. Traditional Hookey plays to 101, but you can go as high as you wish. 2. To decide who throws first, each player throws six rings. The highest scorer starts the game. 3. The first player throws 6 rings, one at a time, and tallies their score. If all six rings are hooked, the player throws a bonus 7th ring. After this, play alternates to the next player. 4. To win, a player much reach the agreed upon point value exactly. Any points scored above the winning value are subtracted! GET A GAME GOING: Easy to play and hard to win for ages 8 and up! If you have any questions about this product by Brybelly, contact us by completing and submitting the form below. If you are looking for a specif part number, please include it with your message.